Send me your address via my contact page or PM. CONGRATULATIONS! A couple of weeks ago, I blogged about an article I had read that inspired me to embrace this unknown season of life I’m in, rather than run from it. I tweeted about the article and because social media, I ended up virtually meeting the author, Paul Angone. Turns out, Paul has just written a book all about navigating the shaky, weird decade that is your twenties. The book is All Groan Up: Searching for Self, Faith, and a Freaking Job. I began reading it and very quickly began to recognize myself in the book, which is the sign a good book. (Scroll down for info about a giveaway…) Paul is so refreshingly honest about his faith and the difficulties and joys of it in the midst of a difficult season. I may have even cried a little in some parts. Because the book has been so helpful for me, I asked Paul if I could interview him about it and post it on my blog, because I think he might just be able to help and encourage you too: You talk about the “best years of our lives” always being the life stage we are coming out of. Why do we always look back and think, “Those really were the best years of my life”? And, what are the best years of our lives?? When you’re scared out of your mind about the present and future, it definitely makes you appreciate the past. However, it took me a long time to realize that nostalgia is a liar. Each season carries with it the good, the bad, and the awkward. The best season of your life is the one you’re in right now, if you’re willing to look for it. You are open about anxiety in the book. I know for me, anxiety became a real thing in my twenties. I think this happens for a lot of us. Why is that? What hope can you give to the anxiety-prone? For many years in my twenties Discouragement, Depression, and Despair followed me around like sick dogs trying to sit in my lap whenever I sat down. And I was definitely anxious about the whole ordeal! I learned that I had to war for hope, even as the world seemingly warred against it. As anxiety would start to squeeze my heart like a hungry Boa Constrictor, I would hike above the Hollywood Sign in LA and literally declare the hope of my future, even when my present felt like nothing to be hopeful about. Fortunately, as anxiety has become real for me in this decade, so has God’s grace. You talk about a wonderful encounter with God’s grace after hitting rock bottom. What is it about the twenties that makes grace so real and so necessary? In our twenties, there’s no hiding from our mistakes and failures. They are all too real and in our face. I was definitely on a free-fall search for rock bottom, weirdly hoping that the bottom would at least bring stability. Thankfully God stopped my descent with what I call a rocky ledge of grace. Grace breaks you, yet somehow makes you more whole. Do you think men and women cope with this life phase differently? I think we all have visions for how life is “supposed to” work out and we feel the pains and frustrations differently depending on what part of our “supposed to” is going up in flames. I love when you say that sometimes our dreams are on a “low simmer.” Meaning, we are working toward them even when it’s not overtly obvious that we are. How can we find joy and peace during our “low simmer” seasons? I love having big dreams, goals, and visions of making an impact. During “low simmer” seasons I found joy and peace by realizing that if you want to dream big, you must first have the courage and perseverance to be faithful in the small. The bigger the promise, the more intense the preparation. You share some great relationship stories in the book—some about successful relationships, some about not-so-successful relationships. How would you advise twentysomethings to approach dating relationships and friendships? Do you know what comment I receive the most in emails from twentysomethings? I feel so alone. We are globally connected, yet are insanely isolated and are not talking with each other about what’s really going on in our lives. This isolation was one of my driving motivations for being as honest and vulnerable as I possibly could in this new book All Groan Up. We ALL have struggles, fears, and questions, so let’s really talk about it in our dating relationships and friendships. We can’t let what I call the new OCD – Obsessive Comparison Disorder – put a wedge between us and all our friends who “appear” to be doing so much better than us. 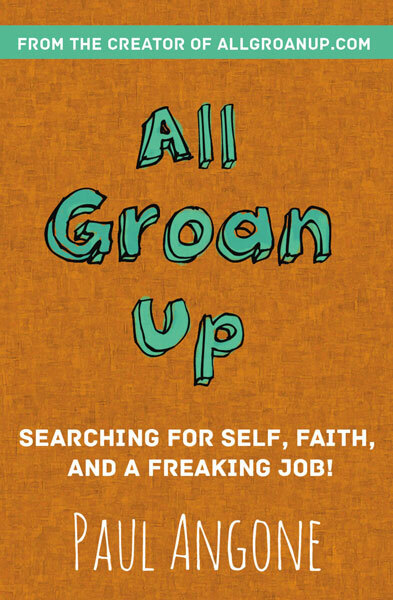 More about Paul: He is the author of All Groan Up: Searching For Self, Faith, and a Freaking Job! (Zondervan) and 101 Secrets For Your Twenties (Moody). He is also a sought-after national speaker and the creator of the popular website AllGroanUp.com, a place for anyone asking “what now?” Follow him on Twitter @PaulAngone. Book giveaway: I have THREE copies of All Groan Up that I am giving away! You can enter your name for the drawing by posting a comment below. If you want you name entered twice, subscribe to my blog by entering your email address in the box on the right and clicking “Follow.” I’m no math expert, but I’m pretty sure having your name entered twice increases your chances of winning by about 4,000%. I can definitely relate to this! My twenties haven’t been at all what I expected, but in some ways that’s a good thing! I would love to read this book. Thank you Missy!! I’m honored. THIS. Yes. It definitely hits home for me. Depression and anxiety have become a huge reality in my mid-to-upper 20s – I finally found my breaking point, but I have also found that Grace you were talking about. I have to read this book! Yep, we definitely all need to be talking about the very real struggle we’re going through. No one has it all figured out! Yes! Now someone gets it! Most of my twenties have been season after season of God molding me and stretching me and preparing me for the next season! 🙂 I can totally relate to what he’s talking about already. I’d love to read his entire book! Thanks Stephanie! Yep our twenties can be a strange, prolonged season of breaking, which somehow makes us more whole. The paradox of paradoxes. I love his new “OCD” term – it’s SO true that we are all obsessively comparing ourselves to each other, and yet each one of us has our own personal hopes and fears and loneliness and low-simmering dreams. Love his perspective, would love to read his book! This looks like a much-needed book! Sometimes it feels crazy not being all sorted out by the time one hits mid twenties. I love that there is a book that says its ok and that it is actually normal. Sounds like a great read! “Low simmer” is the best way I’ve heard yet to describe that period in life where it feels like you’re not working towards your big goals. I would love to read the rest of this book; I feel like it would really hit home right now! I’m honored by your extremely kind words Andrea and am very thankful we have connected. Our 20s are definitely a lot harder than they looked on the front of the brochure. It took me a long time to realize that success in our 20s is more about setting the table than enjoying the feast. Thanks for having me on your site today and I can wait to connect more with the amazing community here. So much encouragement coming from Paul’s writing. Love that I’m not the only one that feels like a crazy twenty-something. So great to hear from other twentysomethings who are going through very similar things. Good to know there is also a light at the end of the tunnel. What a great interview on a very interesting-sounding book! Thanks for sharing it, Andrea. Would love to have the book to give to my daughter – 25 – who says she is having her mid-life crisis now! Man, I’ve been following Paul’s All Groan Up blog for a while and I really find it awesome how well he’s able to relate and speak to the troubles of twenty-somethings (especially in a humorous, non-condescending way lol). I think I may have read him saying this on another site (maybe RELEVANT) but it’s really helped me to learn satisfaction — “The best season of your life is the one you’re in right now, if you’re willing to look for it.” And especially in this season of being about to graduate college, I’ve had to learn that for reaal. lol. I would love to share this book with my 3 “20 something” daughters! This sounds like a great book! Being in my early twenties, just out of college and into the world all by myself, I guess this will be a great guide for me! This book sounds great! I’m graduating college and definitely feeling the whole new phase of my life thing. Even though I am well out of my twentysomething years, I woud very much like an opportunity to read “All Groan Up.” You are never to old to start all over again. Thank you.